Phulka Roti / Chapati are the softest of all Indian flat-breads. They are made to puff up by Cooking them on direct flame, creating an air pocket in between, hence making the bread very soft. It is also very rich in nutrients and fibers that whole wheat brings along with it, and also low in fat and very light on the stomach. Phulka Rotis are usually served with Curries, Gravy or Vegetable Sabjis. 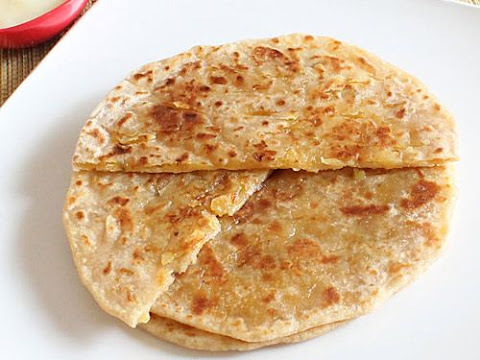 Find Easy to Understand Phulka Roti Recipe Below. 1. Take 3 cups of Atta / Whole Wheat Flour in a bowl. Add salt, a bit of Water and oil/ghee and start mixing. 2. Begin to knead the dough adding a bit of water in between. 3. Keep kneading the Dough till it becomes soft and pliable. The Dough should not be very soft or very hard. 4. Now make balls of the dough as per the size of the phulka roti required. 5. Flatten the ball with your hands and dip it in whole wheat flour before rolling it on the board to make a flat round circle. 6. Put the Tawa on the Gas Stove and make it Hot. 7. 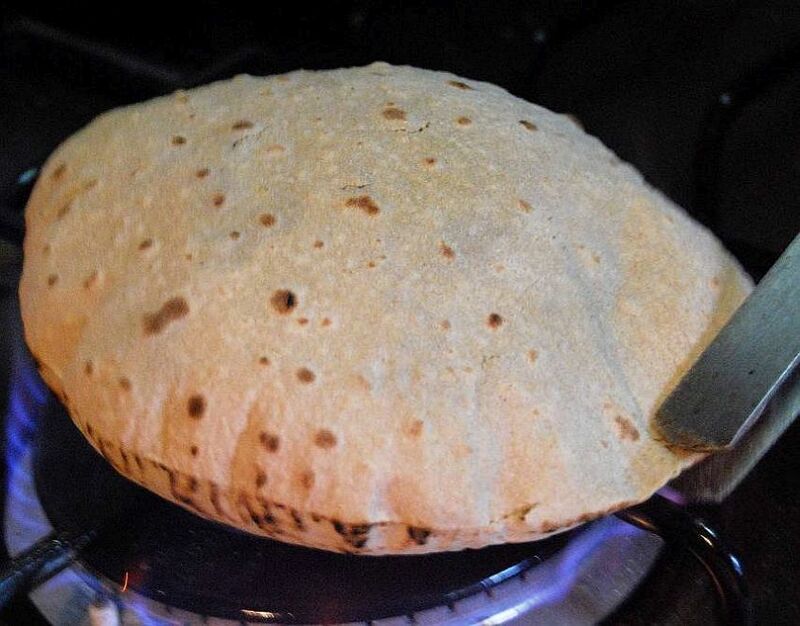 After the Tawa is Sufficiently hot, put the round phulka roti on the tawa. 8. When the bottom side of the roti is less than half cooked, turn the roti and cook the other side. 10. Now cook the first side of roti on direct flames using a Tong. The Phulka roti will start to Puff. 11. Similarly cook the other side of roti on direct flame and the roti will puff some more. Avoid burning the roti. 12. Now your Phulka roti is ready. Now apply some ghee or oil on the roti to keep them soft for a long time. 13. Serve the phulka roti hot if possible or you can store the roti in a Hot Pot Roti Basket or a Casserole. 14. Serve the Phulka roti with Dal or Vegetable Sabji. Tips : To make the Roti more Softer, Add 1/4 Cup of Milk to the Dough during Kneading. Puran Poli is a popular maharashtrian recipe made during Holi, Gudi Padwa,Gaanesh Chaturthi or diwali or any other festive occasion. Puran Poli is a flat bread stuffed with a sweet lentil filling made from skinned spilt bengal gram/chana daal and jaggery. In marathi language the sweet filling is called as Puran and the bread is called as Poli. 1. Wash the daal under running cold water. Then Soak it into warm water for 30-45 minutes. If using chana daal then soak for 1 to 1½ hours. 2. Drain the Soaked water and discard, add daal to pressure cooker with fresh 2½ cups of water. Cook the daal for 4 whistles or till the daal is cooked. 3. Drain the daal water so that only mashed Daal Remains. 4. Heat a Pan on medium flames and add mashed daal and Jaggery. Jaggery will start to melt. Keep Stirring. 5. It will start to thicken up. Keep Stirring to prevent Sticking to Pan. 6. As it thickens more, Add cardamom powder, saffron and mix well. 7. To check the consistency of Puran, try to make the spoon stand vertically in the center of the puran. If the spoon falls cook a little more to achieve good consistency. Now the puran is ready. 8. Let the Puran cool, meanwhile make dough. 1. Mix dough and salt in a bowl. Add a little oil and mix. 2. Start kneading dough by adding little water at a time. Dough should be smooth and soft. Cover it and let it rest for 15 minues. 1. When dough is ready and puran is cool to touch. Divide the puran into 6 equal portions smooth balls. 2. Also divide the dough into 6 equal portions and make smooth balls. Flatten it out between your palms. 3. Put the Puran ball in the center of Dough and start gathering the edges, pinch in the center to seal. 4. Dust a little flour and roll gently to make round poli. 5. Heat the tawa on medium heat. Once hot place one poli and let it cook on bottom side, you will see small bubbles on top. 6. Smear some ghee on top. 7. Flip and cook by pressing gently with spatula. 8. Smear some ghee, by this time bottom part has few brown spots and it is cooked. 9. Flip and cook by pressing again the other side. 10. Once cooked from both sides, remove it to the plate, apply some more ghee on top and serve hot immediately.